The Mestersvig Base Metal Project in eastern Greenland comprises three 100% Ironbark owned exploration licences which contain the historic high-grade Blyklippen Zinc-Lead Mine and the outcropping Sortebjerg Zinc-Lead Prospect. The Blyklippen base metal mine operated between 1956 and 1962 and produced 544,600 tonnes of high-grade ore in excess of 20% zinc + lead for a recovered grade of 9.9% zinc and 9.3% lead. Previous explorers identified additional mineralised structures near the main mine and the project area is considered prospective. In its 2011 exploration programme, Ironbark drilled under the historic mine to test for deep extensions. Three diamond holes were drilled and all intersected a mineralised structure at depth as shown in the figure below. 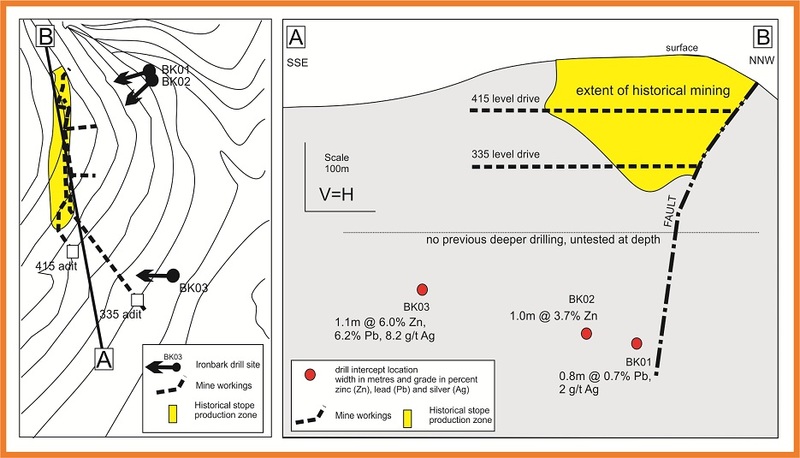 Drill hole BK03 returned 1.4m @ 10.93% Zn+Pb & 8.2g/t Ag from 263.0m, which is significant as it proves a down dip extension of over 200m of mineralisation below the historical workings. 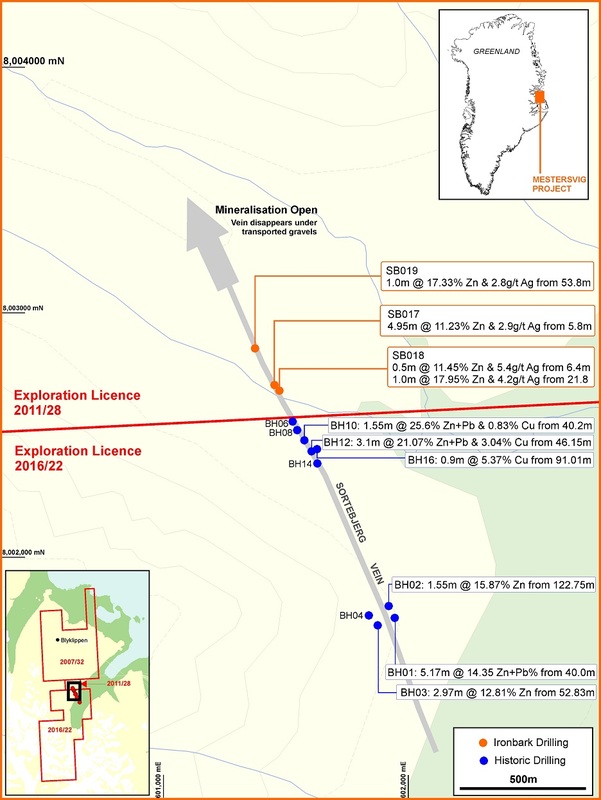 Ironbark has recently acquired a new exploration licence which covers the historic drilling. Significant intercepts and drill hole locations are shown in the figure below. 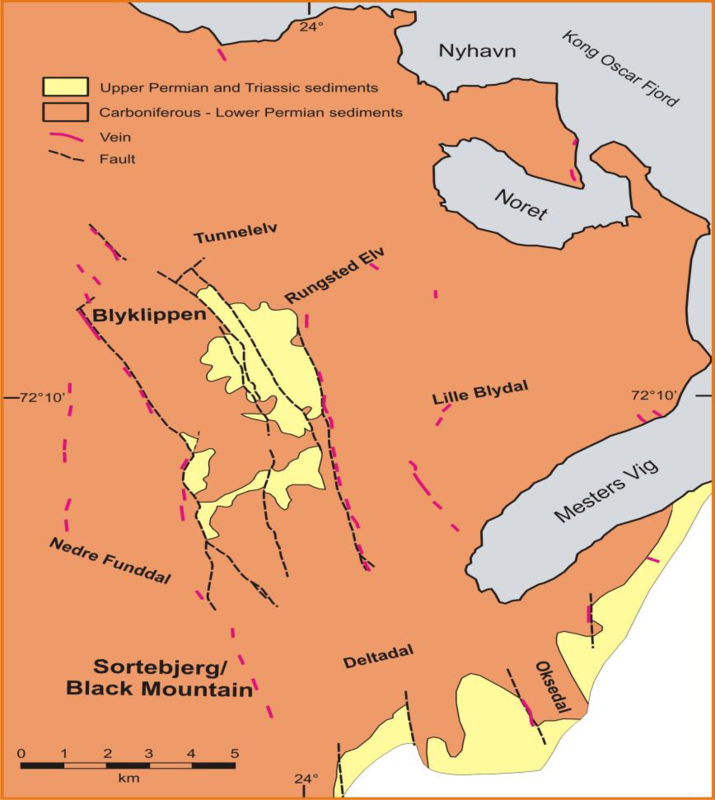 The high grade mineralisation at the Sortebjerg prospect covers a strike length of at least 1km and is open to the north, south and at depth. The mineralisation is fresh sulphide from surface and from the drilling completed to date shows excellent continuity. Drill hole locations and significant intercepts from the Sortebjerg Prospect.